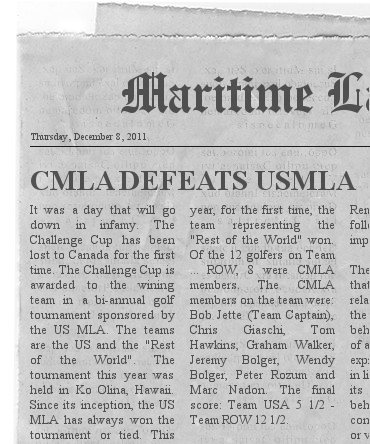 Welcome to the website of the Canadian Maritime Law Association. Members of the public are invited to browse the public parts of our website to learn about us. If you have an interest in Canadian maritime law and are not already a member of CMLA, please apply for membership. If you are a member of CMLA, it is recommended that you proceed directly to the Members Only section which contains additional News and Events relevant to members as well as the full database of CMLA reports and AGM documents. CMLA members may retrieve their passwords here. The CMLA joins in congratulating Gillian Grant, Senior Counsel in Maritime Law at Transport Canada, on her recent appointment as permanent representative of Canada to the International Maritime Organization (IMO) in London, for an initial term of three (3) years. Gillian has long been a CMLA member and Chair of its IMO Liaison Committee. She will be greatly missed at meetings of the Board of Directors, but she will now be able to deploy her considerable talents in a most effective manner, in her new, international posting. All members, directors and officers of the CMLA wish to thank Gillian for her devoted service over the years and wish her every happiness and success in London. At the same time, the Board of Directors is looking forward to working with Gillian's successor at Transport Canada, Joseph Melaschenko. Applications may now be submitted for two (2) part-time positions, viz. : a) Administrator of the Ship-source Oil Pollution Fund (SOPF) and the Fund for Railway Accidents Involving Designated Goods (FRAIDG); and b) Deputy Administrator of the SOPF and FRAIDG Funds. These are part-time, Governor-in-Council appointments, involving no fixed salary or benefits, but providing a per diem allowance, based on the number of days actually worked in the said positions. Applications must be submitted by 11:59 p.m. Eastern Time on September 23, 2017, via the Governor in Council Appointments website (https://www.appointments-nominations.gc.ca/lgn.asp?lang=eng). Cover letters should be addressed to the Deputy Secretary of Selection Processes, Senior Personnel Secretariat, Privy Council Office, and should be sent only through the online application. It was announced on June 9, 2017 that Prothonotary Roger Lafrenière has been appointed a justice of the Federal Court of Canada. Born in Saint-Boniface, Manitoba, Justice Lafrenière graduated from the University of Manitoba Law School in 1982 and was admitted to the Manitoba Bar in 1983 and to the Ontario Bar in 1996. After working in private practice, then in the federal Department of Justice in Winnipeg and in Treasury Board Legal Services in Ottawa, he was appointed Prothonotary of the Federal Court in the Toronto Local Office in 1999 and since 2003 has been a Prothonotary of the Federal Court. The CMLA, whose members have often had occasion to appear before him, join in extending congratulations and best wishes to Justice Lafrenière, as he assumes his important new functions in the Federal Court of Canada. Andrew P. Mayer, hitherto Vice-President, Commercial and Regulatory Affairs and General Counsel with the Prince Rupert Port Authority, has just been appointed a justice of the British Columbia Supreme Court, to replace Mr. Justice R.T.C. Johnston, who elected to become a supernumerary judge, effective December 12, 2016. Our heartfelt congratulations to Andrew on this well-deserved appointment, together with every wish for his success and happiness as he assumes his judicial functions. We will miss him on our Board of Directors but are delighted that Andrew will now be able to deploy his considerable talents as a justice of one of Canada’s foremost superior courts. The Office of the Governor General of Canada reports that CMLA's Honorary Member, Alfred H.E. Popp, Q.C., has been appointed a member of the Order of Canada "for his contributions to maritime law as a lawyer, policy expert and administrator". All members of the CMLA are delighted to learn this news and join in sending heartfelt congratulations to Alfred on this signal honour, which is so fully merited. The CMLA is now proud to have Alfred H.E. Popp, C.M., Q.C. among its Honorary Members, and we look forward to his continued interest and support in our future endeavours. 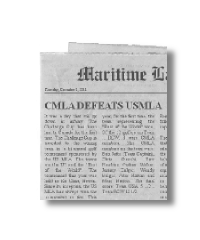 The CMLA is once again offering the "William Tetley Award", a contest open to Canadian authors of high-quality articles, papers or publications, in English or French, on topics of maritime law, or any other topic of an educational nature pertinent to the marine industry. University law faculties in Canada and the major Canadian maritime organizations have been advised. Papers submitted will then be reviewed by the Selection Committee with a view to the awarding of a monetary prize of either five hundred or one thousand dollars, as determined by that Committee. The winning submission will be published in the Canadian Maritime Law Journal (or republished there with the consent of the copyright holder, if the article has already been published). Submissions should be printed out on 8-1/2" x 11" paper, accompanied by an electronic copy on a CD-ROM in pdf format, and sent to: Mr. P. Jeremy Bolger, Chair of the Selection Committee William Tetley Award c/o Borden Ladner Gervais LLP 1000 De la Gauchetière St. W. #900 Montreal, Quebec H3B 5H4. Submissions must include the name, postal and email addresses and telephone number(s) of the author and the submitter (if other than the author). Deadline:	Submissions must be received no later than December 31, 2016. CMLA Annual General Meeting (AGM) and Maritime Law Seminar - Quebec City - June 2019 June 12, 2019 - WISTA-Canada to host a pre-AGM cocktail at a location in Quebec City close to the Manoir Victoria Hotel. June 13, 2019: CMLA AGM - Manoir Victoria Hotel, 44 Côte du Palais, Quebec City, approx. 1:00 p.m., to be preceded that morning by an (optional) visit to the premises of Le Groupe Océan (including an on-board educatioal tour of one of its vessels) and an (optional) lunch at the Hotel.